After the trials and tribulations of the Spa 24 Hours, where the team scored a fighting finish in its first 24 hour race, the Embassy 911RSR was trucked back to base in need of some serious TLC. Any 24 hour race will take its toll on the machinery, but several trips into the gravel - and more to the point, being clouted by several other cars - had given the team a long job list to attend to, before a demanding weekend’s racing on the Silverstone Grand Prix circuit. The fact that they completed all the tasks in considerably less than two weeks was a credit to them. To present a car as spotless as that which actually appeared was a true show of professionalism from these guys. Embassy had already made a substantial contribution to the weekend’s proceedings, Jonathan France’s Embassy Race Radio initiative bringing racing action from both British GTs and the Saturday 6 hour Le Mans Endurance Series race to a worldwide audience. 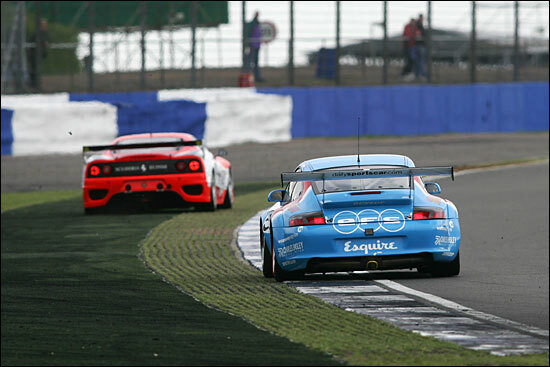 So then two hours at Silverstone lay ahead for Collins and Cunningham, the Ferraris of Scuderia Ecosse looking to put the nail in the championship coffin, but with Embassy aiming to send them away with more still to do. 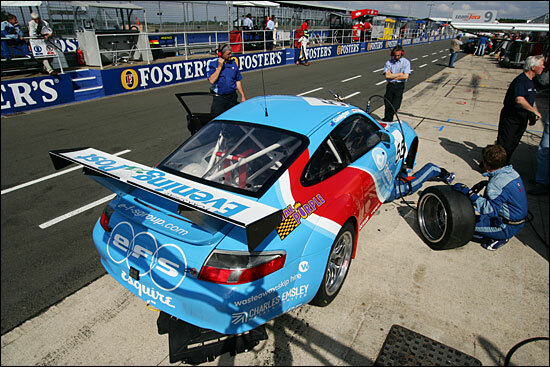 A two hour race, particularly in potentially changeable conditions, might have provided the ingredients needed to allow the Porsche to play to its strengths. Saturday’s qualifying session would see the first indication of relative pace, the Ferraris showing their class, but Embassy were well in touch: a 1:54.727 would see them a handy for fourth on the grid, alongside the rapid Eclipse Mosler. A few drops of rain just before the start persuaded the Clerk of the Course to command two exploration laps behind the Safety Car, before racing proper commenced. But with those two laps (and the time they took) counting towards the two hours, everyone was impatient to get going as ‘lap 3’ began. One of the GT3 911s then dumped its oil on the racing line soon afterwards, and next time around the Safety Car was back out once again and stayed out for around 20 minutes. 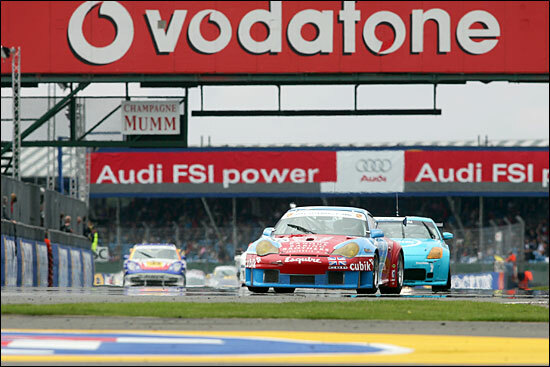 Phil Keen had split the Ferraris on that single racing lap and, by the end of lap 10, the second flying lap, we had Kirkaldy and then Keen’s Mosler, Niarchos, then Ben Collins in the blue and red Embassy 911, Reid and Caine, then Jones’ RSR and Whight’s Mosler. Kirkaldy was easing away at the front, 5.5 seconds ahead of Keen’s Eclipse Mosler by lap 14, while Niarchos and Ben Collins were putting on the best show, switching third and fourth twice. This was an interesting sample of what was to come, but no more than that. Things were about to get very interesting indeed,.as spots of rain appeared on lap 19, and bands of cloud were fast approaching. That meant patchy rain would punctuate the middle third of the race. Kirkaldy’s pace slipped to 2:03s (from a best of 1:54.756), the remarkable Phil Keen closed in, Niarchos spun, Ben Collins was now unchallenged in third, and Reid passed Caine at Stowe. Scuderia Ecosse readied its intermediates, while others chose to leave their men out as they were. Lap 21 and Keen took the lead from the championship-leading Ferrari, and Niarchos dropped out of contention with another spin. But what to do on tyres? Black clouds were approaching. Stay on slicks, pick inters or chance wets? It would take another 60 minutes before we knew which was the best choice and what an hour of power that would be! The Embassy crew made the right choice – but they didn’t know that yet, and wouldn’t do for almost the whole of the remainder of the race. Keen exited Woodcote sideways in the Mosler as he completed lap 23, but Andrew Kirkaldy pitted. Wets were fitted, and with the Nissan fitting inters, we had Keen on slicks, lapping in 2:21, from Ben Collins – also on his slicks (2:23). Kinch was nearly a lap down as he rejoined, Ben Collins held the gap at 19 seconds to the Mosler, and by lap 27, the top three were lapping in 2:09/10 on slicks, Kinch in 2:15 on wets. So it had begun to dry out, and the #35 Ferrari was lapped…..
No driver could drive for more than 90 minutes and Eclipse, Embassy and Eurotech left their men out there to race – even when rain fell again on lap 29. The top two slowed to 2:13/2:15, Kinch in 2:19. Mullen was lapping in 2:09! Inters did look like the preferred choice. No, hang on, lap 31, 45 minutes left – heavy rain, at least on the pit lane side of the circuit. Keen edged away, and still stayed out next time around – but Ben Collins didn’t. It had stopped raining, but the track was wet: wets or slicks? Or inters? Cunningham jumped in, the existing slicks were left on. Brave, very brave. The tyres could have been changed with no time penalty. 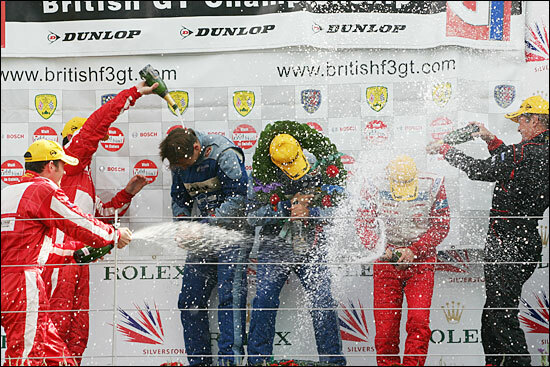 But Jonathan France’s team knew more than its driver…..
Kinch was faster than Keen at this stage, but Ben Collins’ fine work saw Neil Cunningham emerge in third, ahead of the #35 Ferrari. The clouds, driven along by a gusty wind, had slipped by, and it was getting brighter. 38 minutes left, eight minutes for Keen and Caine to do their best on their slicks, and treadles rubber might be the thing to have at the end…. Car #55, drive through penalty….. Embassy hadn’t got the stop right (too quick by four seconds) and Neil had exceeded the pit lane speed limit. Any chance of the win gone, surely? Except that the Aussie / Kiwi was on slicks…. After Neil had taken his penalty, he was 53 behind the leader, Bentwood next in the Nissan. 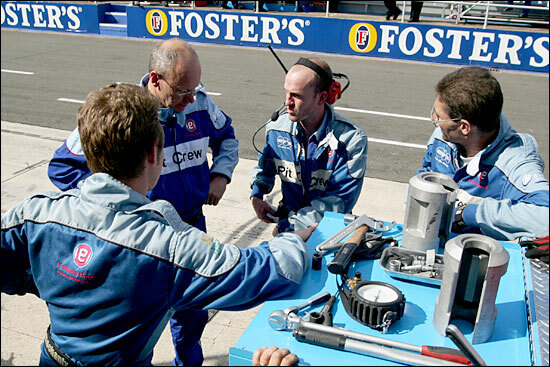 Neil looked as though he would be passed by the Nissan for third – inters were still the tyre to have. Kinch and Bentwood were quickest among the leaders. Kinch gained 20 seconds on Hyde in one lap, and the Nissan did pass the Embassy 911. Cunningham passed Hyde. This was switching and changing all the time. Lap 42 and Cunningham was 63 behind Kinch. “We didn’t tell him where he was on the track, we just told him to go as fast as possible and pass everything,” said Jonathan France, later. 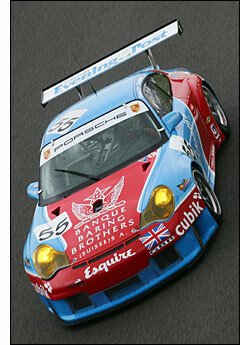 Which is exactly what Neil did: lapped cars, GT3 cars, GT2 cars - he passed the lot (below). 14 minutes left – and the first signs that slicks might be the answer soon. Embassy Porsche matched Scuderia Ecosse Ferrari, the gap still 63 seconds. But there were only 14 minutes (seven laps as it turned out) left. Cunningham gained three seconds, his first gain, on lap 44 – then six seconds on lap 45 (but it was 54 seconds to Kinch, with only five laps to go.. an impossible task, surely?). 46 laps, bright sunshine, and Neil Cunningham was in the 2:05s, ten seconds faster than Nathan Kinch. Finally, after all the track changes, the choice was slicks. But could Neil pull it off? He was still third behind the Nissan, but after 48 laps he was 0.2 behind the 350Z, and all of a sudden the gap to the leader was only 20 seconds. Kinch was looking for wetter bits of track…. If Neil Cunningham had got stuck behind the Nissan, it would have been all over – so he followed instructions and barrelled past on the outside at Copse, and charged on. Lap 49, 7.8 seconds behind. There was one lap left. Paul Truswell, out at Stowe, called “2.6 seconds”, and at Abbey they were right together. Four corners from home and Neil Cunningham took the lead: it had been an inspired strategy from Embassy, but it needed a Collins and a Cunningham to pull it off. Nathan Kinch was 2.8 behind at the flag, Scuderia Ecosse sealing the Drivers’ Championship (but we don’t yet know which pair will take it – although it’s looking clear cut), with the Nissan a great third. It was an emotional Neil Cunningham on the podium, after a difficult week – but he and Ben Collins handled the raceday conditions fabulously, and took a memorable win, despite that drive through penalty. 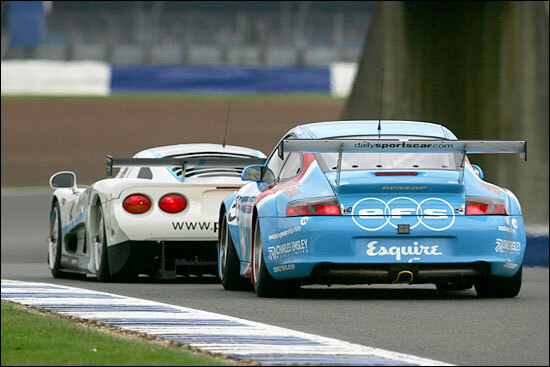 This was British GT endurance racing at its best. GT3 was a thriller too. Unlike on Saturday, the weather really made this one. 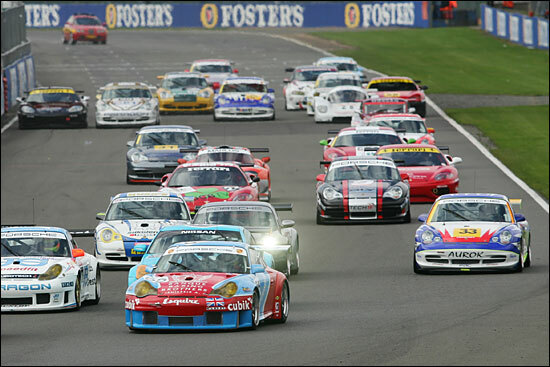 After a slow start, it was one of the best British GT races of all time. 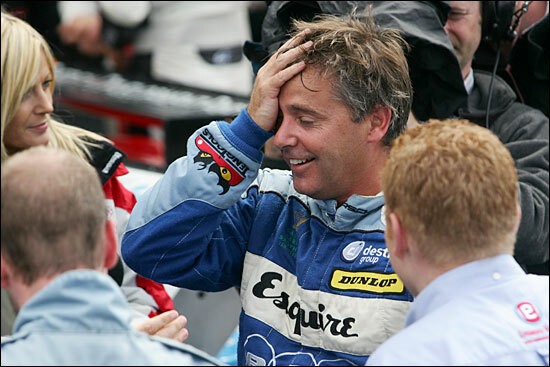 It was entirely appropriate that Jonathan France would see his car take the chequered flag first. Ben Collins: “That was a brilliant result. I was just thinking it was about time for me to get out of my race suit, as we had no chance of a podium, when it all started to change very quickly. “We stayed on slicks throughout, the same as at Knockhill! Despite the fact that it really threw it down at times, staying on slicks and staying out was the way to go. The weird thing is though that we’d have won on wets with no drive through and we won on slicks even with the penalty. Neil Cunningham: “That was an amazing result after what has been a really tough week, let’s just say I was pretty focused on the drive today. I really wasn’t sure whether I’d won it but the crowd were on their feet and going nuts so I thought it might have been on. A second win of the year then for the team – they’re shaking up the established order in British GT racing and doing in a way that is bringing a following to the #55 car. Well done to Neil and Ben, to the whole Embassy Racing team for their efforts in preparing a car that the boys could race hard for two hours - and in particular to Jonathan France for adding something very special to GT racing, doing it the way it should be done.